If a pitcher reaches his or her daily maximum pitch limit while facing a batter, then the pitcher may continue to pitch to that batter until the earlier to occur of: (i) that batter reaches base; (ii) that batter is out; or (iii) the third out is recorded to complete the halfinning (e.g., a runner is caught stealing during that batter’s at-bat to end of the inning). Following the occurrence of any of the foregoing, a new pitcher must enter the game prior to the next at-bat for the opposing team. 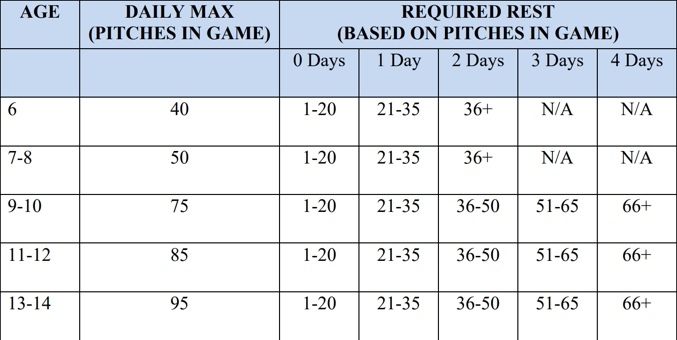 A player’s daily maximum pitch limit is determined by that player’s actual age and not his or her “league age.” By way of example, a 10-year old playing Bronco will still be limited to 75 pitches until he or she turns 11 during that season. Thank you for your participation and adherence to this important policy.